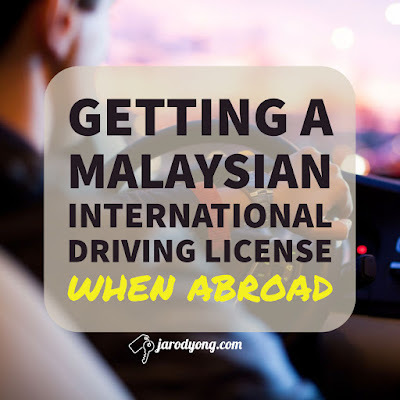 This was how I (1) got an International Driving Permit (Permit Memandu Antarabangsa/IDP), and (2) renewed my Competent Driving License (Lesen Memandu Kompeten/CDL), from NYC. No, you don't need to return to Malaysia. Yes, you can do the same from anywhere in the world! All you skeptics out there can can call JPJ to confirm, the proper term to use is "memohon permit memandu antarabangsa DENGAN WAKIL". In 2018, I called the Consulate General of Malaysia in NYC & was informed that they did not provide services related to driving permits/licenses. This might be similar in other consulate generals/embassies. They mostly help with legal issues or passports matters. In 2018, I called JPJ to make sure that all of this was possible. It worked for me & it should work for you. Find someone you can trust in Malaysia who's willing to help you out. They'll need to make their way the nearest JPJ (Jabatan Pengangkutan Jalan) or AAM (Automobile Association of Malaysia/Persatuan Automobil Malaysia). Shouldn't take them more than 2 hours to get this done. Download & fill the necessary forms. For IDPs, you'll need to download & fill Borang Permohonan Lesen Memandu (JPJ L1). In "Jenis Permohonan", make sure to enter "04" (for Permit Memandu Antarabangsa). For CDL renewals, you don't need a form. Mail all the necessary forms & documents to your trusted runner in Malaysia. I wasn't in a hurry so I used the cheapest letter mailing option & it worked. Caution: DO NOT mail any cash! For IDPs, you'll need (1) a completed JPJ L1, (2) a CDL that won't expire for at least 1 year, and (3) a passport photo. For CDL renewals, you'll need (1) the original CDL that you want renewed, and (2) a passport photo for them to scan. JPJ made it so easy. No surat pengesahan wakil from you or your original identification documents necessary! You will need to figure out a way to reimburse your runner for the IDP (RM150/year) & CDL renewal (RM30/year) fees. Wait for your letter to arrive in Malaysia, your friend to get it done, mailed, & your documents to arrive in your mailbox! Easy! Check your license expiry date here. If you're license has already expired, you usually have a grace period before you have to retake the entire driving test. If you're license has expired beyond the grace period, you can appeal. If your appeal is successful, you don't need to take the law test (Bahagian I: Ujian undang-sndang). However, you will still need to take the 2 practical tests (Bahagian II: Ujian mendaki bukit dan ujian meletak kenderaan. Bahagian III: Ujian memandu di jalan raya).